With millions of Americans retreating indoors from the cold to their hot tubs, the issue of hot tub safety is obviously a massive concern right now. Thankfully, one of the most safety aware professional athletes in the United States is on the case. When Steve Funkensloppen of The American Hot Tub Safety Association (AHTSA) started his search for a Hot Tub safety awareness endorsement candidate, he wrote one name down on a piece of paper and brought it to his superiors. That name? Peyton Manning. Funkensloppen knew from the moment he was tasked with finding a suitable safety awareness star that Manning was his man. Funkensloppen has always been a Denver Broncos fan and he was elated when Manning was brought on board to push the Broncos to the next level. Watching the veteran QB give classic displays of how not to get hit as a QB, Funkensloppen put one and one together and knew he had his Hot Tub safety awareness superstar. "Have you ever watched Manning drop like a dead animal every time an opposition linebacker gets within five yards of him? That’s veteran awareness, that’s veteran safety awareness right there," an excited Funkensloppen told us in an exclusive interview. "His entire career, Manning has dropped, safely, to the ground, avoiding sacks and showing kids all over America how to put safety ahead of you know, toughness and winning, and stuff like that." Manning was delighted to be approached by Funkensloppen and together with the AHTSA they have come up with a number of Hot Tub safety tools, for example the NFL team branded Hot Tub safety helmet in the above picture. 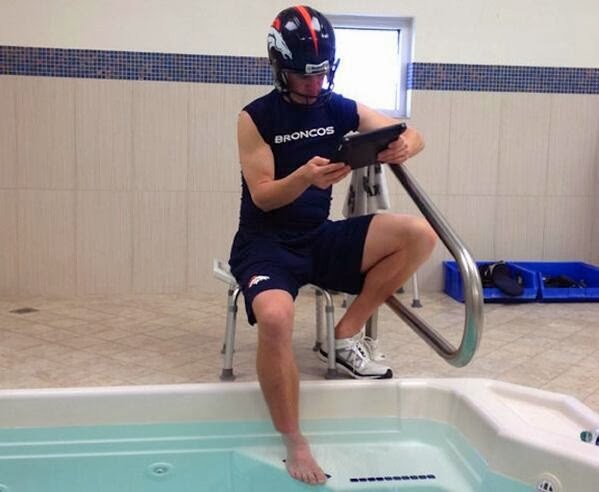 Manning can be seen in the same picture watching his favorite cartoons on a modified, water-proofed iPad with smooth, protected edges so veteran QBs won’t cut themselves while playing in the Hot Tub. Unfortunately the great man himself, Peyton Manning, could not be reached for comment, as he was preparing for the San Diego game on site shooting a Papa John’s Pizza commercial.